Just as with your own hair a wig requires daily maintenance but by following these simple tips you should be able to wear a natural looking wig with only a minor impact on your daily routine. Be sure to purchase a canvas wig form that matches the measurement of your wig from your wig maker. This will ensure that your wig continues to fit well over time. One of the most important parts of wearing a Medical Hair Prosthesis is proper care and maintenance. Just as you would have a handmade suit or dress cleaned, altered, or fitted by a professional, so should you give that much more ca sre and attention to an MHP. We provide our clients with information on basic maintenance, cleaning, and care for their MHP Hair System, but in order to maintain the MHP’s natural look, fit, and durability, it should really be serviced by a professional on a regular basis. Our New York City office features a full-service salon in a private, comfortable setting where all our clients may come for regular cleaning, styling, and repair of their hair system. Our sensitive and courteous staff will make you feel comfortable at all times in our salon, and all styling and hair cutting is done in private rooms. Because our product is handmade and customized for each individual client, we have our own in-house production team onsite. This means that any alterations or repairs can be completed in the least amount of time possible and under the direct supervision of Joseph Paris. 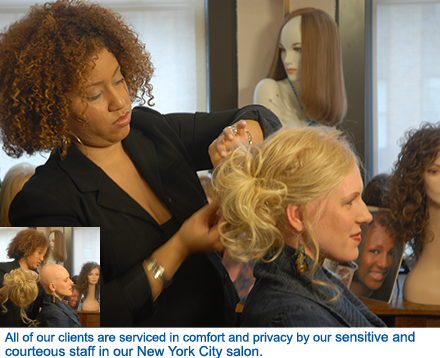 yourHAIRx has many clients who live outside the greater New York area. We recommend that all clients living abroad send their MHP’s to our New York facility for regular maintenance, but also provide each of our clients with the information they need to properly maintain their hair system at home as well. We invite those of you who live out-of-state, but still want to experience all that the yourHAIRx MHP system can offer, to take advantage of our Mail Order program. Click here for more information. For our clients who want to wash and style their hair systems at home, we have prepared some washing and taping instructions for you to refer to when you are going to do it yourself. Please see the items under “Tips & FAQ” right here on this website. Reminder: We invite all of our clients to come back for ONE complimentary follow-up two weeks after their purchase. This follow-up appointment ensures that you are taught the necessary steps to operating and maintaining your MHP hair system properly and if necessary, to make any adjustments. It is at this time that we can address any questions or concerns you may still have regarding your new purchase.